SoundCloud Shortcode is a plugin that converts all SoundCloud shortcodes into embeddable SoundCloud players. All themes available on MagicPress that support it come with the plugin preinstalled and activated. The plugin works for any SoundCloud track, playlist, user, or group. Once installed, it works for any of your posts or pages. 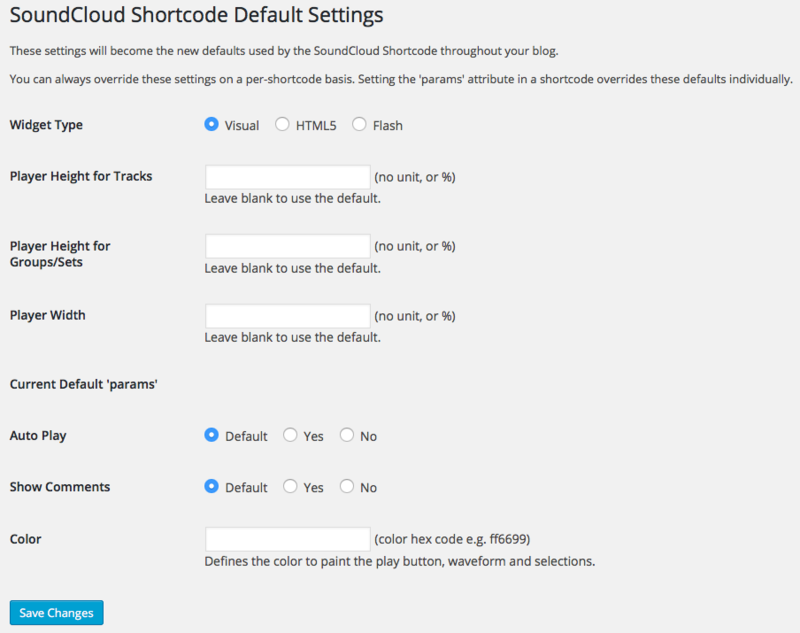 The SoundCloud Shortcode default settings can be accessed under Settings > SoundCloud in your WordPress dashboard. You can choose whether the widget will be displayed as a visual, in HTML5 or Flash. You can also customize the player’s dimensions and set the widgets default parameters for embedded content. The params parameter passes additional options to the SoundCloud embeddable player. A full list of these options can be found on the SoundCloud Developers pages.